It isn’t every day that a doctor says your inability to lose weight isn’t about willpower. The real culprit behind stubborn pounds is your hormones and they often get ignored altogether. Carb cycling, stress busters, and sleep hacks can lead to long-term weight loss and happy hormones. Your weight isn’t about willpower. 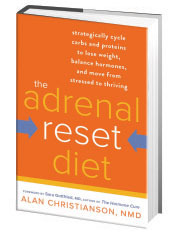 This is one of the main ideas put forth in Dr. Alan Christanson’s new book, “Adrenal Reset Diet,” which covers how things like “carb cycling,” stress busters, and sleep hacks can lead to long-term weight loss and happy hormones, no matter what stage of adrenal fatigue you might be in (i.e., kinda tired or full-blown exhaustion). Your adrenals hold the key to regulating the stress response, which, in turn, holds the key to your weight, your mood, and nearly every other important biological function that keeps you sane and healthy. So if your adrenals are in a state of chaos, your body will go into “survival mode,” which is, as you might guess, the exact opposite of thriving mode: everything is more stressful and taxing because you’re tired, cranky, and unable to reach an ideal weight. The calories in vs. calories out myth. Food restriction doesn’t work, he says, because most people who are struggling to lose weight are already in “weight-storage” mode; that is, their bodies are preparing for famine. So when people attempt to cut calories in order to lose weight, many times this can actually make things much worse on a hormonal level. Carbs aren’t the enemy. Contrary to popular belief, carbs aren’t actually the enemy! Yes, we do need to “cycle” them appropriately with proteins (and eat the right kind of carbs), but low-carb diets can impair sleep quality. And Dr. Christianson says that when your sleep is impaired, you’re more likely to have poor willpower when it comes to your diet. Stressing less is the key. A man after my own heart, Dr. Christianson emphasizes the idea that a high-stress state is one of the worst conditions for your body, especially if you want to lose weight. Stress makes your body store food as fat, instead of burning it as fuel. Daily prescriptions for health. The book also outlines some simple tips for keeping your adrenals healthy for the long-term, including getting at least 30 minutes of sunlight a day, eating and sleeping at regular times, and consuming your largest meal in the evening (not at lunch, like many health experts suggest). This helps promote a natural state of relaxation and increases your alertness during the day. Dr. Christianson is holding a free Q&A webinar on December 30, 2014 about the truth why you have no energy and can’t seem to lose weight. To register (and to submit your questions directly Dr. Christianson), click here.